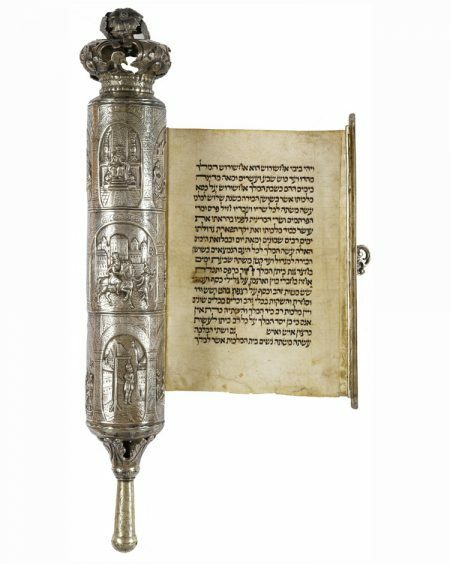 This Esther scroll case is decorated with an unusually elaborate program of vignettes illustrating the Esther story. Nine detailed scenes are enclosed in three tiers of decorated arches. Depicted are: at the top, Ahasuerus seated on a majestic throne, flanked on the right by Ahasuerus crowning Esther, and on the left by Ahasuerus extending his scepter toward Esther; at the center, Mordecai in royal attire riding on the King’s horse led by Haman, flanked on the right by Ahasuerus being read his chronicles, and on the left by Mordecai refusing to bow to Haman; and at the bottom, Haman hanging on the gallows, flanked on the right and left by scenes of Jews dancing and feasting. These episodes from the biblical narrative are rendered in skillfully worked repoussé and chasing, with careful attention to spatial settings and architectural backgrounds. A large openwork Hapsburg-style crown tops the case. Silver, repoussé, chased, and cast, 405 mm (15.9 in.) Scroll: Central or Eastern Europe, 19th century Parchment, ht. 201 mm (7.9 in. ), length cannot be determined.